The Real Teatro di San Carlo (Royal Theatre of Saint Charles), its original name under the Bourbon monarchy but known today as simply the Teatro di San Carlo, is an opera house in Naples, Italy. It is located adjacent to the central Piazza del Plebiscito, and connected to the Royal Palace. It is the oldest continuously active venue for public opera in the world, opening in 1737, decades before both the Milan's La Scala and Venice's La Fenice theatres. The opera season runs from late January to May, with the ballet season taking place from April to early June. The house once had a seating capacity of 3,285, but has now been reduced to 1,386 seats. Given its size, structure and antiquity, it was the model for theatres that were later built in Europe. Commissioned by the Bourbon King Charles III of Naples (Carlo III in Italian), Charles wanted to endow Naples with a new and larger theatre to replace the old, dilapidated, and too-small Teatro San Bartolomeo of 1621, which had served the city well, especially after Scarlatti had moved there in 1682 and had begun to create an important opera centre which existed well into the 1700s. Thus, the San Carlo was inaugurated on 4 November 1737, the king's name day, with the performance of the opera Domenico Sarro's Achille in Sciro, which was based on the 1736 libretto by Metastasio which had been set to music that year by Antonio Caldara. As was customary, the role of Achilles was played by a woman, Vittoria Tesi, called "Moretta"; the opera also featured soprano Anna Peruzzi, called "the Parrucchierina" and tenor Angelo Amorevoli. Sarro also conducted the orchestra in two ballets as intermezzi, created by Gaetano Grossatesta, with scenes designed by Pietro Righini. The first seasons highlighted the royal preference for dance numbers, and featured among the performers famous castrati. In the late 18th century, Christoph Willibald Gluck was called to Naples by the impresario Tufarelli to direct his 1752 Clemenza di Tito at the theatre, and Johann Christian Bach in 1761-62 brought two operas, Catone in Utica and Alessandro nell'Indie. there is no better place for ballet and pantomime. Military movements of infantry and cavalry, battles, and storms at sea can be represented here without falling into the ludicrous. But for opera, itself, the house is too large. Although the singers, Signora Isabella Colbran, [Prima Donna of the Teatro San Carlo opera company and Rossini's future wife], and the Signori Nozzari, Benedetti, etc., have very strong voices, only their highest and most stentorian tones could be heard. Any kind of tender utterance was lost. 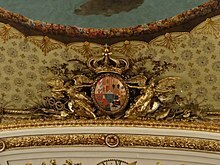 Much admired for its architecture, its gold decorations, and the sumptuous blue upholstery (blue and gold being the official colours of the Bourbons), the San Carlo was now the biggest opera house in the world. In relation to the power of the existing Bourbon Kingdom of the Two Sicilies, Beauvert notes that the design of the house, with its 184 boxes lacking any curtains was so that "no one could avoid the scrutiny by the sovereign" who had his private access from the Royal Palace. In 1809 Domenico Barbaia was appointed manager of the royal opera houses in Naples and remained in charge until 1841. He soon established a reputation for innovative and dazzling productions, which attracted both the public and leading singers to the opera house. On 13 February 1816 a fire broke out during a dress-rehearsal for a ballet performance and quickly spread to destroy a part of building. On the orders of King Ferdinand IV, another Bourbon monarch and son of Charles III, who used the services of Antonio Niccolini, Barbaia was able to rebuild the opera house within ten months. It was rebuilt as a traditional horseshoe-shaped auditorium with 1,444 seats, and a proscenium, 33.5m wide and 30m high. The stage was 34.5m deep. Niccolini embellished in the inner of the bas-relief depicting "Time and the Hour". The central frescoed ceiling painting of Apollo presenting to Minerva the greatest poets of the world was painted by Antonio, Giuseppe e Giovanni Cammarano. On 12 January 1817, the rebuilt theatre was inaugurated with Johann Simon Mayr's Il sogno di Partenope. Stendhal attended the second night of the inauguration and wrote: "There is nothing in all Europe, I won’t say comparable to this theatre, but which gives the slightest idea of what it is like..., it dazzles the eyes, it enraptures the soul...". In 1844 the opera house was re-decorated under Niccolini, his son Fausto, and Francesco Maria dei Giudice. The main result was the change in appearance of the interior to the now-traditional red and gold. Apart from the creation of the orchestra pit, suggested by Verdi in 1872, the installation of electricity in 1890, the subsequent abolition of the central chandelier, and the construction of the new foyer and a new wing for dressing rooms, the theatre underwent no substantial changes until repair of the bombing damage in 1943. During World War II the opera house was damaged by bombs. Following the liberation of Naples in October 1943, Peter Francis of the Royal Artillery organized repairs to the damaged foyer and, three weeks later, reopened the building with a musical revue. With the building in a fit state for performances, more musicians and singers made themselves available and the first opera performance was held on 26 December 1943, a matinee presentation of Puccini's La bohème. Francis stayed on for another two years, producing 30 operas. By the start of the twenty-first century, the opera house was showing its age with outmoded stage machinery, inadequate visitor facilities, and lack of air conditioning. In response, the Campania regional government funded a €67 million renovation over six months in 2008 and six months in 2009 which included restoration of the décor and the creation of a new rehearsal hall. As noted in Gramophone magazine, the opera house reopened on 27 January 2010 with Mozart's La Clemenza di Tito, the 254th anniversary of the composer's birth: "The renovation work was completed last year under the direction of architect Elisabetta Fabbri and is intended to return Teatro San Carlo to its condition following Antonio Niccolini's rebuilding after the fire of 1816. The project....involved 300 workers day and night. At the time, Neapolitan School of opera enjoyed great success all over Europe, not only in the field of opera buffa but also in that of opera seria. The Neapolitan school of opera composers included Feo, Porpora, Traetta, Piccinni, Vinci, Anfossi, Durante, Jommelli, Cimarosa, Paisiello, Zingarelli, and Gazzaniga. Naples became the capital of European music and even foreign composers considered the performance of their compositions at the San Carlo theatre as the goal of their career. These composers included Hasse (who later settled in Naples) Haydn, Johann Christian Bach and Gluck. From 1815 to 1822, Gioachino Rossini was house composer and artistic director of the royal opera houses, including the San Carlo. During this period he wrote ten operas which were Elisabetta, regina d'Inghilterra (1815), La gazzetta, Otello, ossia il Moro di Venezia (1816), Armida (1817), Mosè in Egitto, Ricciardo e Zoraide (1818), Ermione, Bianca e Falliero, Eduardo e Cristina, La donna del lago (1819), Maometto II (1820), and Zelmira (1822). After the composition of Zelmira, Rossini left Naples with Colbran who had previously been the lover of Domenico Barbaia. The couple were married shortly thereafter. To replace Rossini, Barbaja first signed up Giovanni Pacini and then another rising star of Italian opera, Gaetano Donizetti. As artistic director of the royal opera houses, Donizetti remained in Naples from 1822 until 1838, composing sixteen operas for the theatre, among which Maria Stuarda (1834), Roberto Devereux (1837), Poliuto (1838) and the famous Lucia di Lammermoor (1835), written for soprano Tacchinardi-Persiani and for tenor Duprez. Vincenzo Bellini, Sicilian by birth, also staged his first work, Bianca e Fernando, at the San Carlo. Giuseppe Verdi was also associated with the theatre. In 1841, his Oberto Conte di San Bonifacio was performed there and in 1845 he wrote his first opera for the theatre, Alzira; a second, Luisa Miller, followed in 1849. His third should have been Gustavo III, but the censor made such significant changes that it was never performed in that version nor under that title (until a re-created version was given in 2004). It was later performed in Rome with significant revisions to the plot and its location, while the title became Un ballo in maschera. Among the conductors and composers appointed by the Teatro San Carlo was the famous and eccentric French harpist and composer Nicolas-Charles Bochsa, who was accompanied by his lover, the English prima donna Anna Bishop, with whom he was touring the world. He conducted several operas (1844–1845) in the San Carlo with Anna Bishop as prima donna. She sang there 327 times in 24 operas. The unification of Italy in 1861 led to Naples losing its status as the musical center of Italy and the home of the country's leading opera house to La Scala as power and wealth moved northwards. By 1874 the fall in income from performances led to the closing of the opera house for a year. Its fortunes were able to recover due to the continued support in the latter half of the nineteenth century and into the twentieth century by Giacomo Puccini and other composers of verismo operas, such as Pietro Mascagni, Leoncavallo, Giordano, and Cilea, who staged their works here. In the late nineteenth century, the house created its own in-house orchestra under Giuseppe Martucci, which helped attract a number of respected conductors including Arturo Toscanini, Pietro Mascagni and composer Richard Strauss, whose influence expanded the opera house's repertoire. One performer who did not appear in Naples from 1901 onward was Naples-born Enrico Caruso, who after being booed by a section of the audience during a performance of L'elisir d'amore, vowed never to return. Gubler, Franz (2012). Great, Grand & Famous Opera Houses (Hardback)|format= requires |url= (help). Crows Nest: Arbon. ISBN 978-0-987-28202-6. 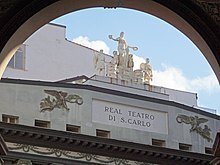 Wikimedia Commons has media related to Teatro San Carlo (Naples).